When it comes to boats, most people come up with two options in their minds: a boat that is made for fishing and the other boats that are made for everything else. Fishing boats are generally smaller, can have outboard motors, and you most likely won’t see them dragging a skier anytime soon! Motorboats, on the other hand, can accommodate fishing and all kinds of other activities for larger groups. You can take out skiers, go tubing with the family, or just take adventure around on the water. If you ask your average Joe what a Pontoon Boat is or what it’s used for, you might get a few blank stares. We have come up with a few different common questions that you might get asked when you tell people about this cool option. What is a pontoon boat? A pontoon boat is boat that uses pontoons for floating rather than the typical boat design. This gives the boat a raft-like appearance that many people enjoy, since the risk of running over rocks is minimalized. What do you do on a pontoon boat? Anything you want! 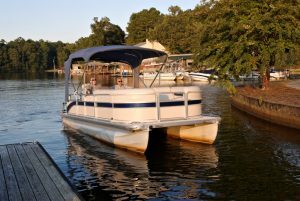 Pontoon boats are large and powerful enough to tow your water toys and quiet enough for fishing or a picnic on the lake. Is it any fun? Only if you enjoy spending time on the water! If you’re curious to see if your family would enjoy spending time on a pontoon boat, at Motor-Boatin LLC, we want to hear from you. Contact us today for all our boat options, including pontoon boats that are available to you. This entry was posted in Boating Tips and tagged Pontoon Boat. Bookmark the permalink. ← Are Pontoon Boats Good for Fishing? Copyright © 2019 Motor Boatin', All Rights Reserved.